NK-4 is a compact kneeboard whose main advantage is flexible and modify design as well as small footprint. This model is a slightly modified version of our military pilots kneeboard used by Polish Air Force pilots flying in foreign missions. Kneeboard NK-4 is the solution enables a fully symmetric rotate 180 degrees while maintaining full functionality of all its components. This solution works well not only on aircraft board, but also on helicopters, where the arrangement of the controllers does not always allow use Kneeboard on the same knee on the left and right seat. 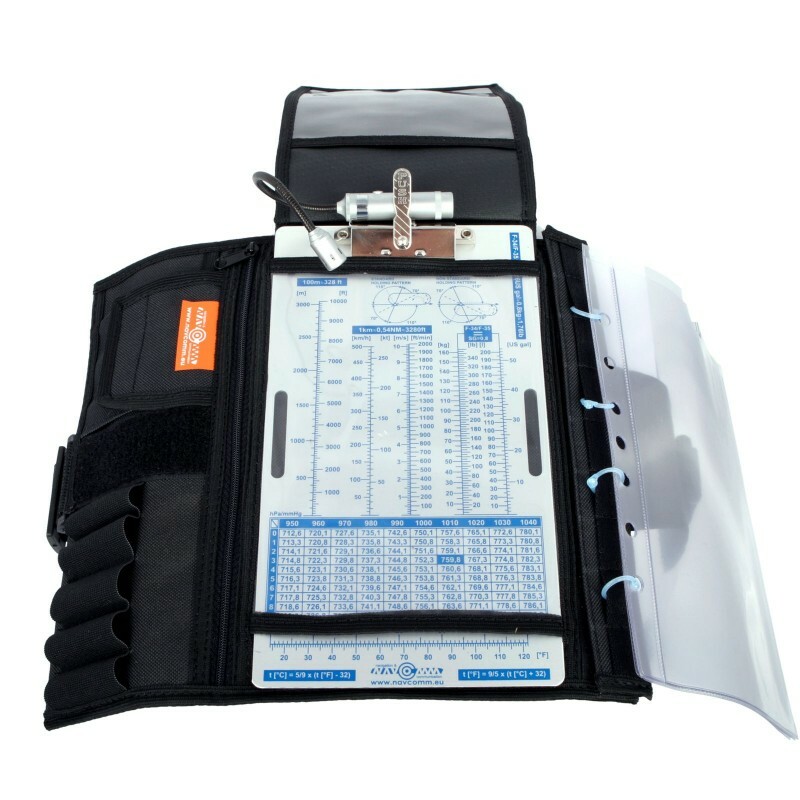 NK-4M consists of four distinct parts: the soft fold-up cover, aluminum clipboard, a set of transparent envelops which are pinned to the Kneeboard by the plastic rings, and an additional set of pockets przypinanego to Kneeboard from the top. 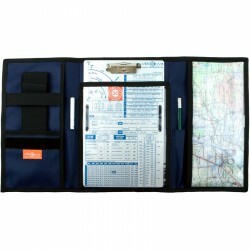 All four elements are designed so that they can be used together or completely independently - additional tape included in the kit allows you to place clipbord on the second leg as well as transparent envelops and second covers set can be quickly disconnected from the main cover thanks to Velcro fastening type. 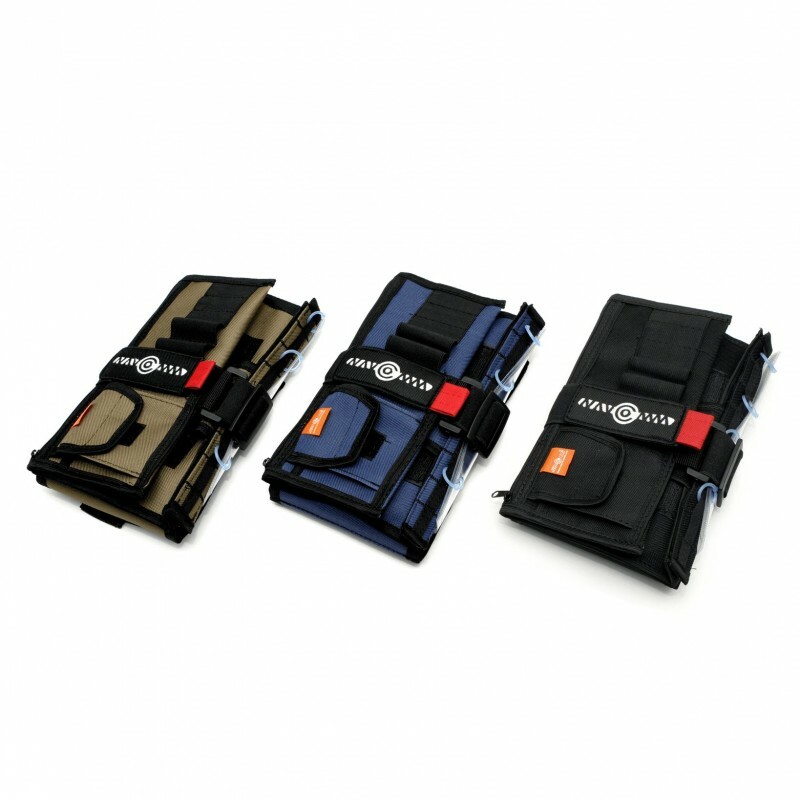 The soft part (cover) is made of a heavy fabric (Cordura 800), avilable in 3 colors (black, navy, khaki) rectangle with a width of 280mm and height of 240mm (unfolded). In the compact form kneeboard width is reduced to about 150 mm (depending on the content of the interior). The inner side of the kneeboard is divided into three sections. 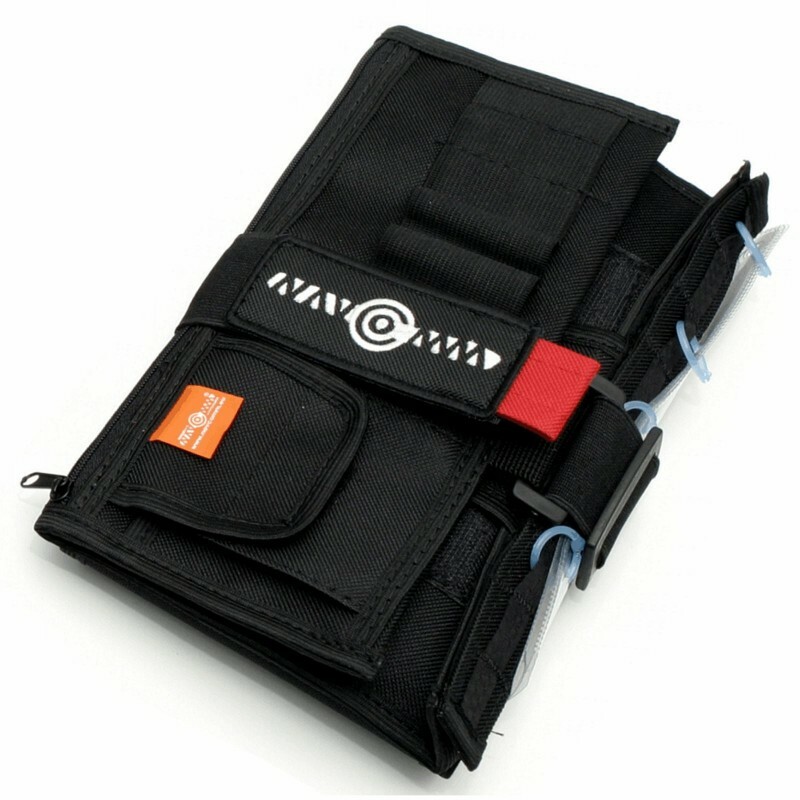 The middle section contains transparent pocket, which provides an access from top and bottom. 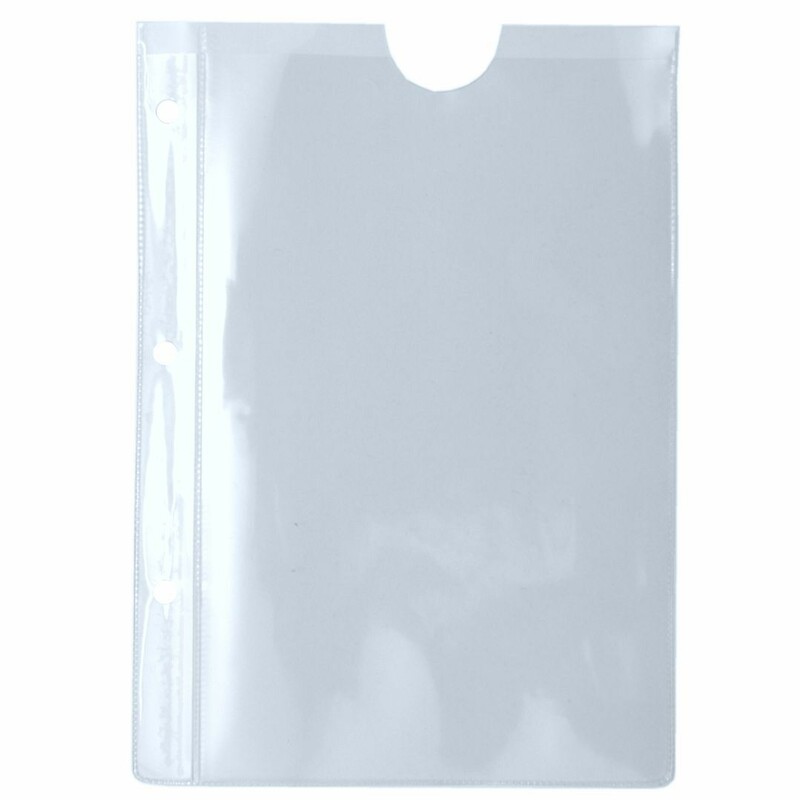 The right wing contains the Velcro tape with plastic rings allowing to bind a transparent envelopes. The left wing contains two material pockets . One of them is zippered and the second one with a flap. 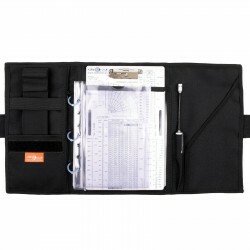 The left wing has also sewn rubber strap with compartments for pens. 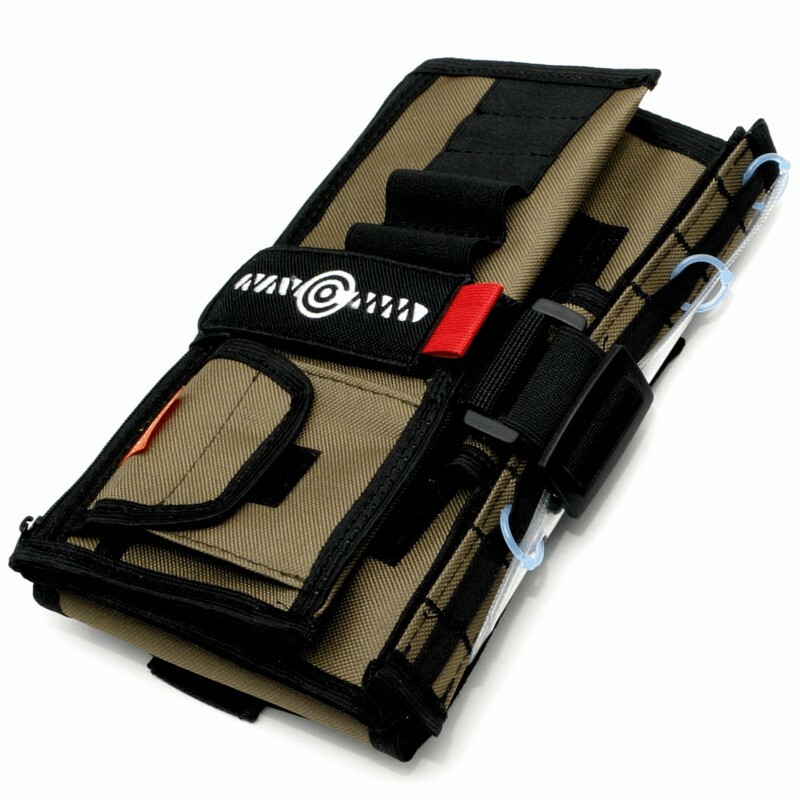 Kneeboard is pinned to the thigh with a rubber strap adjustable in length . 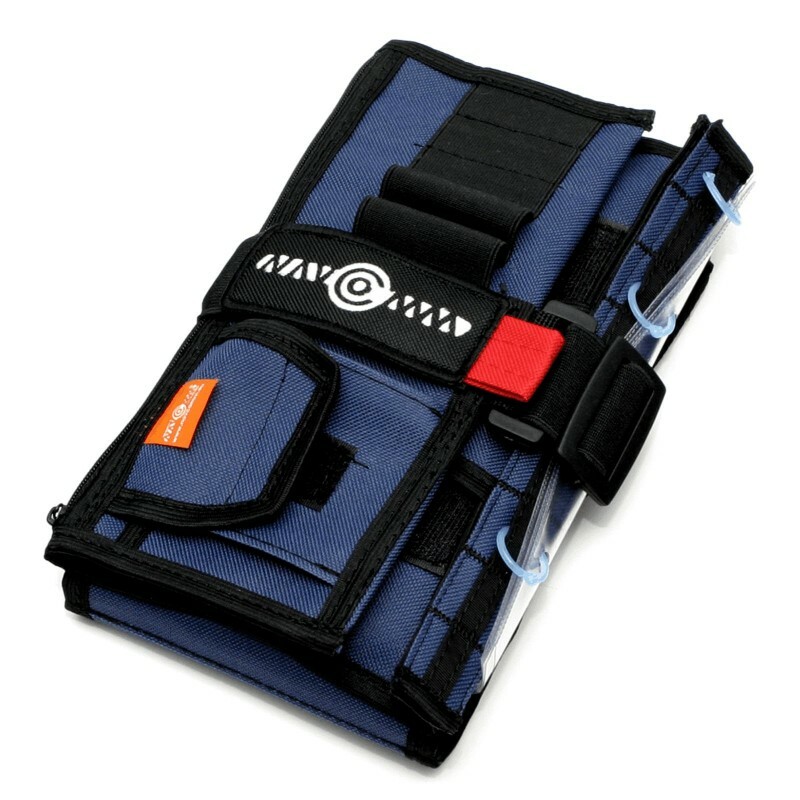 Added to both parts of the fastener Velcro straps allows easily adjusted to the circumference of the thigh. The heart of the Kneeboard is clipbord - aluminum plate with dimensions of 135 to 235mm with the two oblong holes for the rubber strap and spring clip riveted at the top of the plate. Clip has a special mechanism with folding lever saving space and allowing to open-up the jaw with a small force. 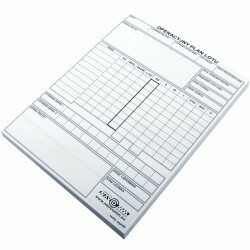 The clipboard surface has an imprint containing a set of tools useful in flight. In among them there are, among others, nomograms to facilitate the conversion of units (m <> ft, km / h <> kt, m / s <> ft / min kg <> lb <> l <> US gal, st.C <> st.F), the table allows convert pressure from hPa to mmHg, and diagrams in the inlet zone of expectations. Printing was made in a special chemical-thermal technology to guarantee its durability by min. 30 years! Kneeboard NK-4 can be optional equipped with a three-color (red, green, white) lighting system called Nav Light. The light source are three LEDs, a power - three small LR44 batteries (included) to ensure the minimum of 90 hours of continuous operation. 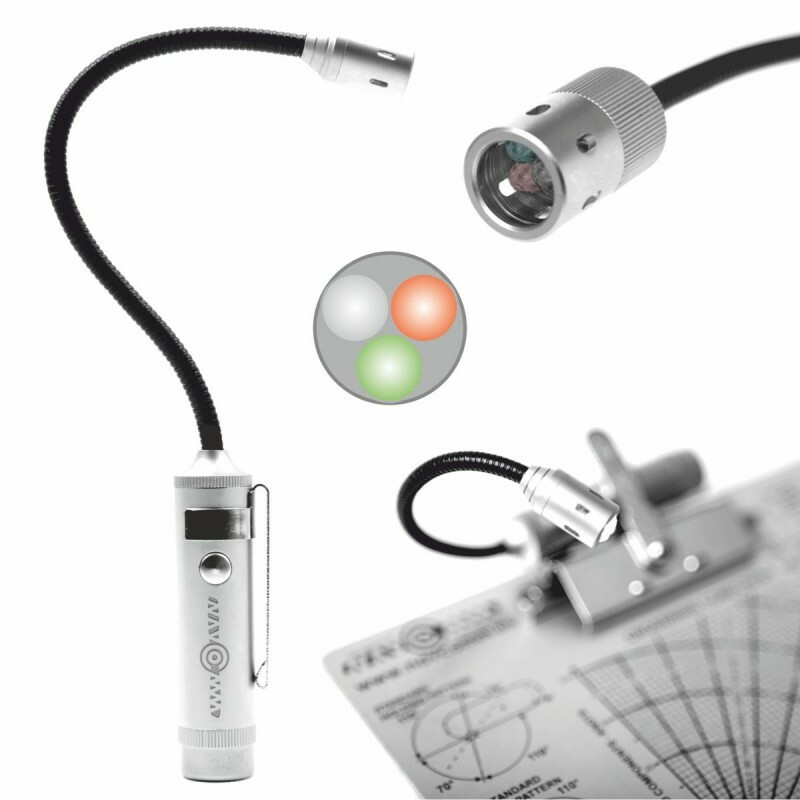 NavLight has a control system that allows to select sequentially one of the three colors of light. 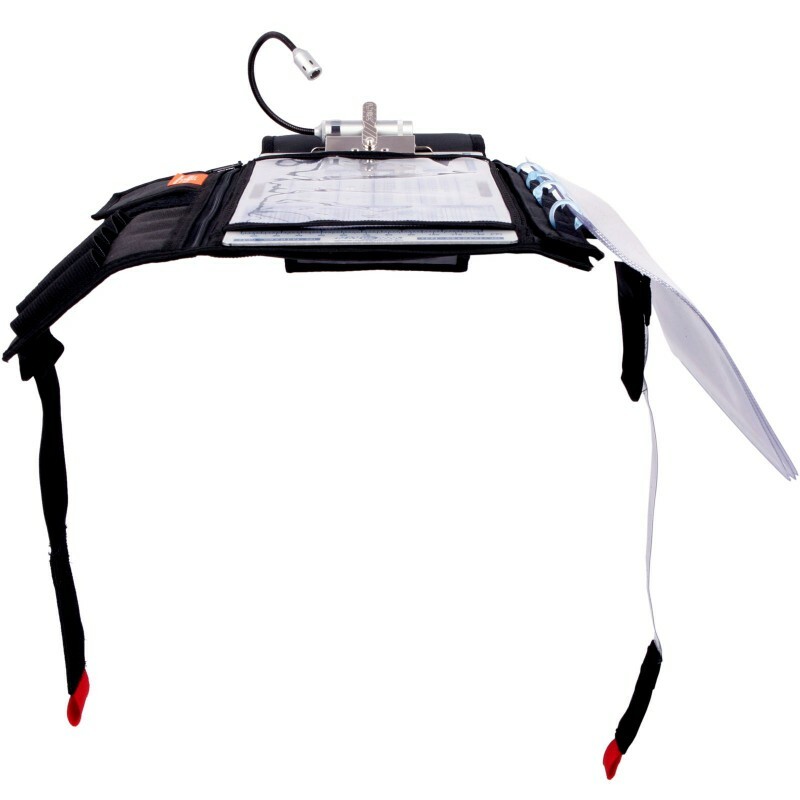 The kneeboard construction provides several locations for attachment NavLight system, including one on clipboard. 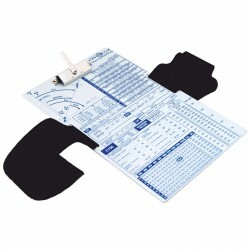 A perfect complement to kneeboard NK-4 are rulers and protractor also available in our shop. symmetrical design allows Kneeboard rotate 180 degrees. I like design of this one more than the others. (Using it more than 5 years). It just could be more robust and durable - needed to do some repairs and changes over the years. Świetny nakolannik. Kompaktowy rozmiar bardzo ułatwia pracę w niewielkiej kabinie. Dużo możliwości przechowania dokumentów czy potrzebnych informacji. Jakość i materiały lepsze niż na zdjęciach. Mi osobiście bardzo odpowiada, polecam!